January was such an exciting month. So many things happening here in Temecula. Needless to say, there are still a lot of challenges ahead of us as we seek to get settled in. Cindy and I are now looking at renting for at least six months and maybe a year. We may actually be renting our daughter’s home for a while as they may be transitioning to the Chicago area for an incredible promotion for Jason. We are so proud of him. I will be back in the Spring’s probably from about the 11th through about the 23rd of February to finish packing up our home and move our furniture into storage. The home actually closes on the 21st. That is a big praise report. While there I am looking forward to connecting with family and some old friends. On the ministry front—I cannot remember a time in recent history where I have been more optimistic and excited. Our church, Sunridge Community, has asked me to begin our OTI here and make it available for the entire valley to be launched with my speaking on Fathers Day. In addition they are talking to us about doing a Couples On Target Saturday event followed by a 6-week follow up series around Mothers day. They have also graciously donated a beautiful office for me to use. 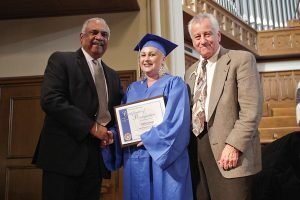 Last week Cindy and I went to the San Diego Rescue Mission where I spoke to their graduation class. Hundreds gathered for this event and God really showed up. I was able to share a great word of encouragement for the graduates as they move on with their lives and discover God’s great vision and plan that lies before them. Cindy and I got to be on the platform and were able to shake the hand of every one of these precious men and women whom God has healed. The Mission has also asked me to consider doing a live OTI there every Wednesday morning for about 150 men in their program. John Ashmen, who is the head of the Association of Gospel Rescue Missions (AGRM), has suggested that his organization may want to partner with us to make the Wednesday teachings available by LiveStream for other missions through the country who may want to participate. You may recall that I had the privilege of bringing a keynote message to their convention a few months back where over 1000 leaders gathered in Jacksonville, Florida. I truly love what this group is doing around our nation. As a result of that event there are now a growing number of missions who have adopted our new curriculum for their men’s programs. One of the things we have learned from our experience rolling out the new curriculum to missions and prisons is the need for a hard copy manual to put in the hands of our participants. Toward that end our producer, Pat McGuire, has designed a wonderful two-part manual that we can produce and make available through print-on-demand. Our current handouts are available on line for each session but must be downloaded individually. The new workbooks will be much better and facilitate students having a resource they can keep with them and use in their devotional time. This is an area you may want to pray about helping us. We need to raise about 5,000.00 to cover the development cost. If you wish to contribute toward this effort please indicate that along with your donation and we will make sure it is designated toward that project. This is the final piece in the completion of our new Men On Target two-year curriculum. Pray that God brings clear direction and peace with regard to our decisions about our temporary living quarters—rent—buy?